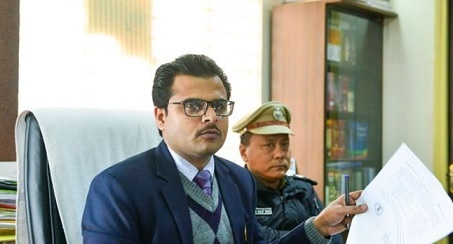 East Sikkim district election officer (DEO) Kapil Meena on Monday informed that the EVM strong rooms at Brihaspati Parsai Senior Secondary School is being guarded 24×7 by one platoon of SSB armed force in the innermost cordon. In a press statement, Meena informed that a three-tier security cordon has been placed in the school complex with the SSB, State Armed Police and district police in the innermost to the outermost periphery respectively. Around 50 CCTV cameras are installed inside each strong room and at important points outside the strong room. Power backup, fire tender and fire extinguishers along with fencing around the premises are installed. There will be regular visits of premises by the district magistrate and superintendent of police to monitor the arrangements, the statement added. No unauthorised entry to the school premises is allowed while the visitors have to carry identity cards. The DEO informed that a room has been identified in the school for representatives of political parties to stay. They can obtain identity cards from the office of the DEO. Regular checking of the said room would be done by the SSB and in case of any prohibited activity, the identity cards will stand cancelled. The school is just below Ranipool town along the NH 10, and about 12 km away from Gangtok. The EVMs containing the votes casted on April 11 for Sikkim Assembly and Lok Sabha elections for east district are stored in the strong rooms installed at the school. In another press statement, the DEO thanked all agencies, polling personnel and general public for making the General Elections 2019 successful. He thanked all the election officials and polling teams along with security agencies. He thanked the CEO, special CEO and Election officers for helping and guiding the east district election team. He further thanked the political parties for campaigning in discipline. There was less number of cases of model code of conduct violations, he said. He informed that the model code of conduct will continue till the counting process is over. “We will shortly be again preparing for the day of counting for which we need support from number of agencies as for the poll day,” he added in the statement.